when your husband, who now works 16 hour days, 7 days a week, sends you a text message that says, “maybe you could try to make one of these today?”, you do it. the chef’s favorite thing in the world to do is cook. so, when he’s asking me to cook for him i imagine it as some sort of proxy cooking adventure where he is living vicariously through my flour scooping, cherry pitting experience. how could i deprive him? 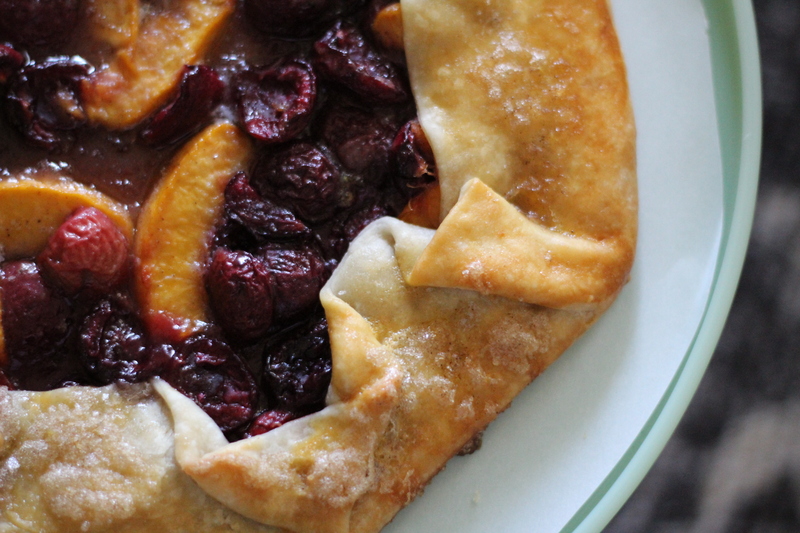 most galette recipes call for using puff pastry as the crust. and about 99% of the recipes i found online used store bought puff pastry. i wanted it to be homemade, but puff pastry is a little out of my league, so i tried it with plain pie crust and it was perfect. btw if you’re looking for the best pie crust recipe ever, stick to the tried and true classic. i use this martha stewart pie crust at least once a week, for sweet and savory purposes. in the food processor, it takes about 5 minutes to whip up. combine sugar, vanilla, lemon zest, and lemon juice in a bowl. set aside a tablespoon of this mixture. add the cherries, peaches and flour to the remaining sugar mixture and mix it up really well. cut up the butter and scatter it on top. roll your dough out. i used the biggest mixing bowl i had and a pizza cutter to make a perfect circle of dough. dump the fruit mixture in the middle and spread it out, leaving two inches all the way around empty. take that two inches, and fold it over onto the fruit. you’ll have to pleat it. whisk the egg really welland brush it over the crust. the more you get on, the shinier and prettier it’ll turn out. take the leftover sugar mix and spread it out on the crust. i’m not usually a crust lover, but this turned out to be my favorite part! 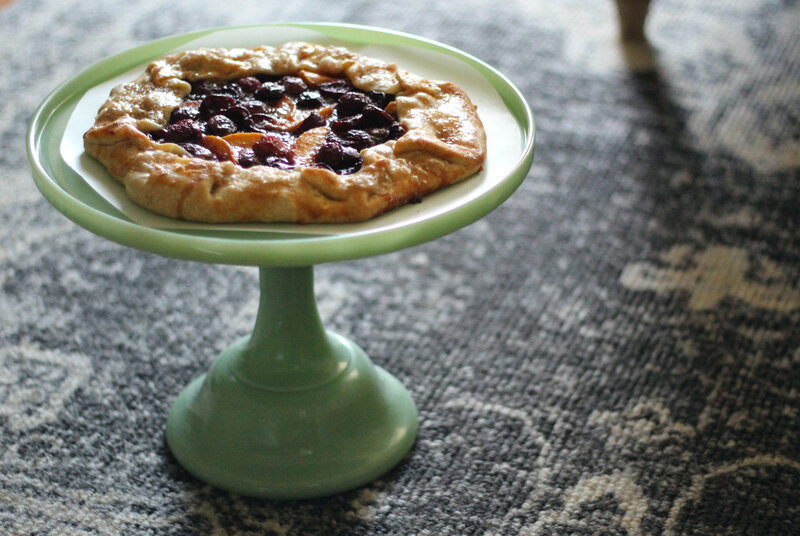 you’ll want to put the galette on a silpat or parchment paper to bake – and use cooking spray so it doesn’t stick!! bake on a bottom rack for 20 minutes. lower temp to 350 and bake for ~30 more, depending on your oven and how juicy the cherries / peaches are. 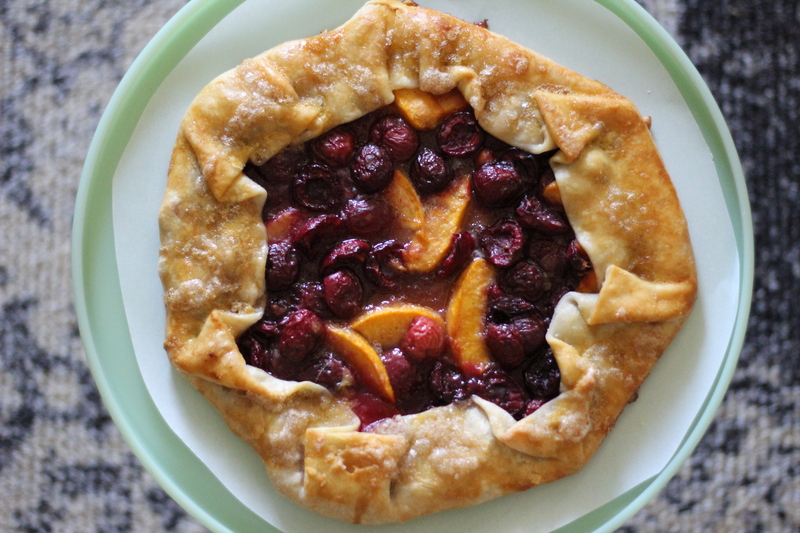 we had this galette with a bottle of champagne and our friends peter & jenny who just got engaged! congrats, guys!! so i guess we’re hikers now?